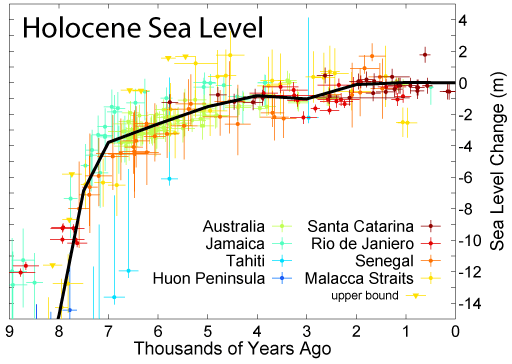 “eustatic sea level has fluctuated significantly over the earth’s history. The main factors affecting sea level are the amount and volume of available water and the shape and volume of the ocean basins. The primary influences on water volume are the temperature of the seawater, which affects density, and the amounts of water retained in other reservoirs like rivers, aquifers, lakes, glaciers, polar ice caps and sea ice. Over geological timescales, changes in the shape of the oceanic basins and in land/sea distribution affect sea level. In addition to eustatic changes, local changes in sea level are caused by tectonic uplift and subsidence.” It is obviously difficult to differentiate eustatic SLR from crustal movements of the earth as our measuring instruments are placed on the earth. The best approach is to assess that water is supposed to remain ‘horizontal’ on a large basin like the Mediterranean Sea, while crustal movements occur at a more local scale (e.g. Crete). Hence, the average of all measured sea level movements on the entire basin will reflect the eustatic SLR, while local deviations from this average will reflect the local crust movements. resulting in ca. 110 m eustatic SLR over this period. These figures are in accordance with work of Nic Flemming (1973 & 1986) who was the forerunner on this subject and with Christophe Morhange (2014). Since the rise of human civilisations around 5 000 BC, eustatic SLR has been around 4 m. This value must obviously be combined with local crustal movements which may have reached several meters uplift (e.g. Phalasarna) or subsidence (e.g. Alexandria, Apollonia Cyrenaica, Portus Iulius, Rome, and many others) and sometimes both (Pozzuoli). As an example, let’s take the area of Rome which has been studied in detail over a period of 2 000 years by Goiran (2009) based on an analysis of marine shells, and by Lambeck (2018) based on an analysis of coastal fish tanks. The first conclude with a relative SLR of 0.8 m, and the latter with 1.22 m, hence both are quite close to 1.0 m. This relative SLR is thus composed of 0.5 m eustatic SLR + 0.5 m crustal subsidence. Relative SLR at Marseille, La Ciotat and Fréjus (Morhange, 2014). 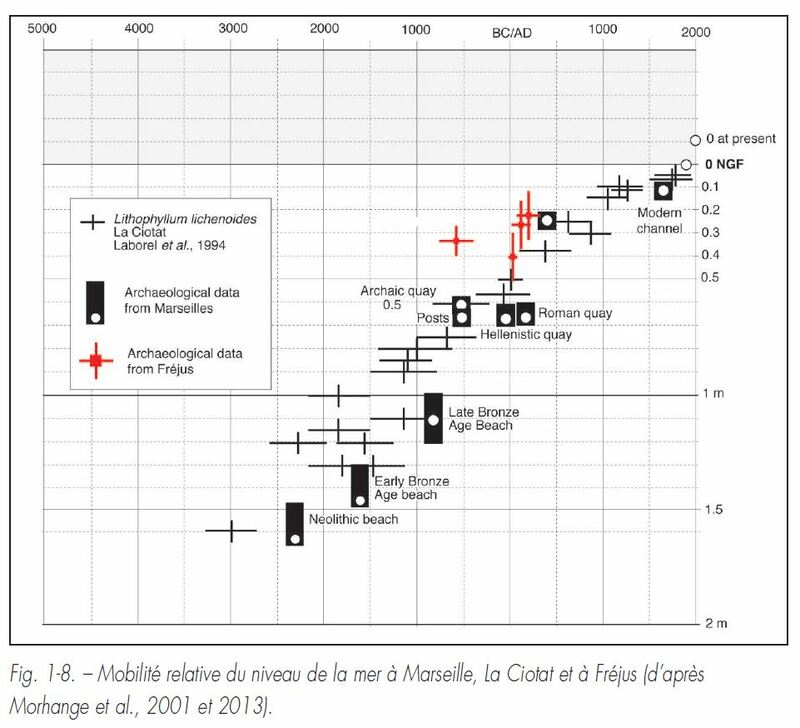 Another interesting case is given by Morhange (2014) who shows that the relative SLR of 0.5 m in 2 000 years in Marseille-La Ciotat-Fréjus equals the eustatic SLR because no significant crustal movements occurred in this area during several millennia. Flemming, N.C., Webb, C.O., 1986, “Tectonic and eustatic coastal changes during the last 10,000 years derived from archaeological data”, Z. Geomorphol. Suppl. 62, (p 1–29). Flemming, N.C., Czartoryska, N.M.G., Hunter, P.M., 1973, “Archaeological evidence for eustatic and tectonic components of relative sea level in the South Aegean”, 23rd Symposium of the Colston Research Society, Bristol, 1971, Pap. 23, (p 1-63). Morhange, C., 2014, “Ports antiques et variations relatives du niveau marin”, Géochronique n°130, (p 21-24). 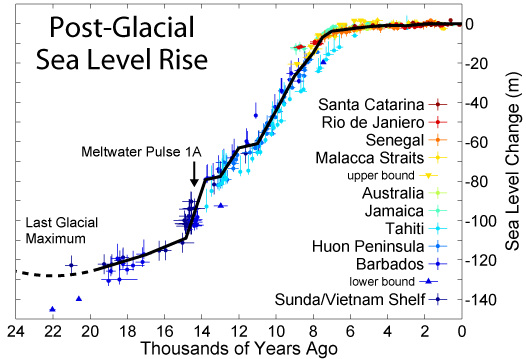 Fleming, K., et al., 1998, “Refining the eustatic sea-level curve since the Last Glacial Maximum using far- and intermediate-field sites”, Earth and Planetary Science Letters 163, (p 327–342). 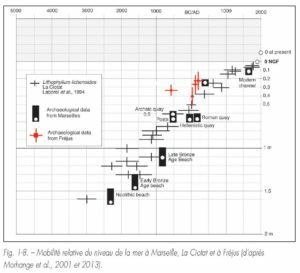 Goiran, J-P., Tronchère, H., Collalelli, U., Salomon, F., Djerbi, H., 2009, “Découverte d’un niveau marin biologique sur les quais de Portus : le port antique de Rome”, Revue Méditerranée, 112 | 2009, (online), (10 p). Lambeck, K., Anzidei, M., Antonioli, F., Benini, A., Verrubbi, V., 2018, “Tyrrhenian sea level at 2000 BP: evidence from Roman age fish tanks and their geological calibration”, Rendiconti Lincei. Scienze Fisiche e Naturali, Satellite Geodetic Positioning for Geosciences, Roma, 2017, (12 p).